With record high temperatures in London at present, the city is suddenly awash with the tropical: denim hot pants, turquoise, fluorescent pink, bright yellow. Even the conservative dresser is using this rare heatwave as an occassion to adorn brightly colored prints. The aesthetic of the tropics seems to seep out of Topshop into virtually every café and bar with an outdoor suntrap. Yet little thought is given to where this trend originates from-the formal, social, communal, and everyday environments that produce this look so evocative of Caribbean vacations-Caribbean homes, interiors, businesses, life. Radamés "Juni" Figueroa's work explores this tropical aesthetic transposed into a formal artistic language. For his exhibition at Edel Assanti, Figueroa has created a wooden sky deck to be clambered on, gathered under, used. 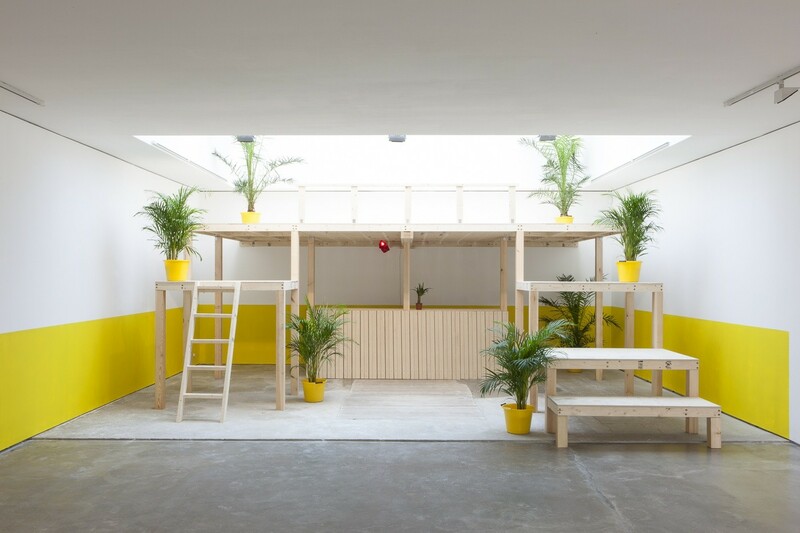 Built from three tiers of platforms over a bar area, and surrounded by a bright stipe of yellow paint on the walls, the arrangement takes the viewer up to a platform right under the heat of the gallery's skylight, up to the sun. Hanging above it are tropical ferns in baskets, and dotted around are yellow buckets containing large tropical plants. Figueroa's signature Tropical Readymades, in the form of basketballs and a football repurposed as planters, are here presented as individual sculptural gestures. On the walls of the gallery are another series of readymades comprising white aluminum storm shutters arranged in grids with laundry trapped and dangling from between the blades. Peach boxers hang down next to laundered socks and a velvety thong. A lone painting, I Dream with Snakes, takes its place next to the large wooden structure. A small painted canvas is mounted on a large vinyl background digitally printed with overlaid, cut and pasted tropical ferns. Figueroa's mixture of work in the exhibition is best understood in the context in which it developed. Trained as a painter, but often working in sculpture, in 2013 Figueroa participated in the not-for-profit organization Beta-Local's year-long fellowship in his home country, Puerto Rico. There he developedCasa Club-The Treehouse of Naguabo (2013), an ad-hoc wooden structure situated in a eucalyptus forest, made with the help of friends from salvaged materials for next to no money. It operated as a place for communal activities, like parties and gigs, but also as a place simply to hang out with friends. As his work has evolved through various manifestations of these communal, sculptural ideas-from that iteration in the forest to a biennial and a central London gallery-some of the spirit of collaboration and ad-hoc ingenuity appears at first to have been usurped by the work's more formal elements. This exhibition as a whole feels like a grappling with how to produce and maintain a tropical, Caribbean formal language in art that acknowledges cultural stereotypes, but doesn't become one. Figueroa's readymades are the device the artist uses to achieve this: objects evocative of their roots, like snapshots of the tropics, are stripped back into their key formal gestures. A grid of white shutters is interrupted with dabs of painterly color in underwear form; a bright, round basketball is deflated and punctured with a plant; the simple symmetrical sky deck's material frugality lends its aesthetic an honesty and charm. Tropical aesthetics are a product of both place and culture, but also as an easy reduction tactic, a kind of knowing nod to a stereotype. But these works also reveal Figueroa's artistic language as representing the cultural mix that Puerto Rico is-Latin American meets the U.S.-but it is also steeped in the formalities of twentieth century American art history. Despite the work's formal appearance, artworks meant to be climbed on tend to lead many lives. Casa Club was always a convivial hub, retaining the spirit of its communal build and acting as a treehouse for friends. Here, the sky deck functions in collaboration with the gallery and artist, who let it be used, and in turn, let it lead people in to share the gallery space. London Poetry Systems, for example, are using the space on July 16 for a cross-media AV poetry event. On July 21 Hammer and Tongue will produce a live poetry slam, and the structure will also be used for music from the likes of The Crisis Project and Robin Katz Trio. The wooden structure acts simultaneously as a sky deck, bar, stage, and tiered seating, carrying the show as a whole by continually reinventing and restating its function and drawing people to it. But it's also clear that Figueroa's readymades are beginning to speak to the atmosphere created in the gallery context. His mix of painterly gestures, formal arrangements, and wry humor become a sculptural language of their own, one that reflects their tropical subjects and the cultural experience of their maker.